This seems to eat up a lot of complexity points at common for relatively little benefit. Also, this feels a lot like putting Reach in white, which I don't love. I imagine this guy being in a set with Phantom Warrior, and the new player feeling cheated that his card lied. That said, I think there is a lot of potential potential in "T: ~ fights target attacking creature." I don't think that is mono-white though... maybe WG or WR. Which complexity points does it eat up, exactly? What color would you give "can block anything" to, if not white? It might want to be uncommon purely to keep this exception-to-other-exceptions from happening all the time. I think the "exception to exception" thing makes this at least uncommon, and I don't think most new players could read this line of text and tell you what it does. Also, this sort of "on board trick" is very rarely at common these days. Play attacks with their Welkin Tern into this, that leads to a very feel-bad moment. I think this has a lot of board complexity, even moving past the understanding of the ability, which is why we don't see stuff like Angelic Page at common anymore. What color is "can basically block anything" is an interesting question. Green gets both reach and shadow-blocking, for example, which would make me inclined towards green (especially since it is such an anti-blue ability). On the other hand, this is a bit like Hollowhenge Spirit and company, which have been white, but I don't think those couldn't hit unblockable things. I would absolutely fight for the simpler template; I'm just not sure it's possible. Can't beats can, so you can't override unblockable. What about a preemptive block? WG, Tap: Tap target creature. It fights CARDNAME. Actually probably way too oppressive with enchantment's equipment. Plus that forces your opponent to attack with anything you like. You're right, this is an extremely elegant solution for 'anti-evasion' (which is something I agree should be possible). I've thought in the past that white should get access to fight, but it would probably have to be as a 'tertiary' color, since fight is solidly in red and green already and white has plenty of other keywords. Since this design uses fight (not normally a white ability) and since it removes things from combat (something that modern design rarely does outside the context of regeneration), I agree that it should be uncommon at least. With regards to Tommy's analysis, I think the ultimate question is whether there's significant need to create that illusion of blocking by having it fight. The Maze of Ith ability is perfectly sufficient as a White creature-based removal alternative to the traditional Master Decoy, especially since it actually plays a bit better since players don't have to tap the opposing creature in between their opponent's main phase but before combat. There is the potential for these two clauses to pair up and create an intriguing top-down design, as a reference perhaps to those cliché fights between the protagonist and primary antagonist amidst larger battles in which mysteriously no one intervenes. 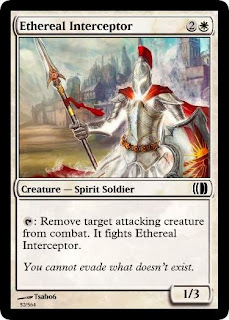 But here, adding the fight clause on a defensively-formatted creature ends up reading more like an "out" for attacking player and contributes to color-pie confusion for little actual gain, unless the format it's position within has an abundance of X/1 hard-to-block creatures that White absolutely needs a permanent solution to. This is a perfect example of the philosophy "just because you can do it doesn't mean you should." Unblockability exists specifically *because* it's not something that should be stopped by anti-evasion abilities. There's already gameplay in Magic that does that: flying and reach. The difference between flying and unblockability is that one can be worked around and the other can't. Creating something that specifically removes unblockability removes the uniqueness of its gameplay. And white doesn't need this ability mechanically because it already has Pacifism effects and tap effects to remove combat threats without getting them off the board completely. Not sure if my point was clear...let me summarize. That's already interesting. If you create something that can "block" unblockable things, you've turned unblockable into "can be blocked by only some things" and then you're treading on flying's gameplay. Doom Blade can kill anything. Except black creatures. Or creatures with regeneration. Or indestructible or hexproof or pro: Black. Unless you use Magical Hack. If blocking is the trace, unblockable is the trace buster and Ethereal Interceptor is the trace buster buster. It happens in Magic all the time. Unblockable already has answers in Blinding Mage and Samite Healer. All that said, here's why I'm inclined to agree with you. Certain effects are so infrequent that they need to be kept special. Indestructible is the poster child for effects we should neither overdo, nor undermine. Unblockable isn't terribly far behind. I agree, though I think the card has some neat ideas. A creature running out to fight an attacker has neat thematic feel. This could make a neat instant, though I don't see a non-awkward way to avoid that creature also blocking something else (which I would like to). Oh, I'm definitely agreeing with you that everything needs answers. It's just that cards get to define *how* they can be answered. Something with indestructible is *designed* not to be Doom Blade-able. A Doom Blade variant that says "this can destroy even creatures with indestructible" is not an elegant design. For the record, I think Glaring Spotlight was a serious misfire. "whenever a creature attacking you becomes unblocked, you may have it become blocked by ~." The big problem with Ninjitsu is that it's not intuitive when a creature is 'unblocked.' It's even less clear when a creature "becomes unblocked." Apart from that, this is great. I look at most of your designs when you post them. Some I like, some I like less, but this is the first time I really felt the need to say: very beautiful ability, flavorful and stylish, playable and easy to understand. Well done! This blog is one of my favorite things on the internet! I really love the discussions here! "After blockers are declared, you may remove an unblocked creature attacking you from combat. If you do, ~ fights that creature." "After blockers are declared, if ~ isn't blocking, it blocks a creature attacking you." When you cast ~, you may put it onto the battlefield blocking target creature attacking you. 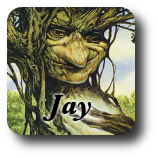 Flash Foliage lets you put a token into play blocking a creture, so I think this wording should work. Not sure if this is more or less confusing than removing an attacker from combat and fighting it. Nice. Doing it just once is probably best. Note that the Oracle text of Flash Foliage is actually worse than this, because of the unattractive "Cast Flash Foliage only during combat after blockers are declared." rider. How many players would know you can put it into play blocking a flier? How many players would know whether you can put it into play blocking an unblockable creature? Very smooth. Essentially, it's worse than "tap target creature" but I like it. It's a nice slice of the pie, "CARDNAME fights target attacking creature". Good, in-colour use of white. You should mention it to MaRo on his tumblr.